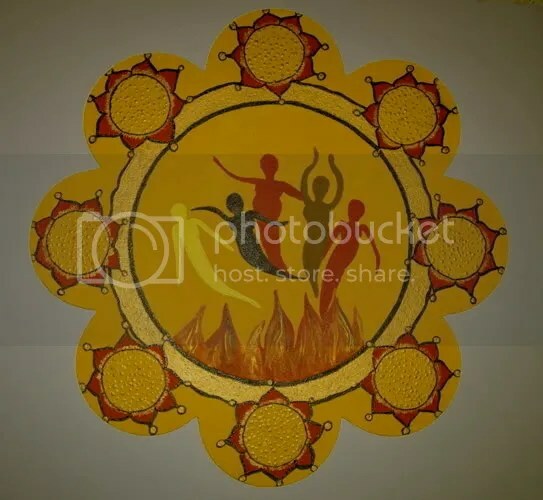 I am developing a 12 piece Mandala series for an Art Exhibition “Talking in Circles”…. I was inspired to do this piece after running a group for Women living in a domestic violence shelter and hearing their stories of having lost their homes, had their dreams and hearts…and sometimes teeth broken….but are now developing the skills, belief in Self and courage to create their new life, free of violence and old patterns. Learning to develop their Mind!!…….Yes! Purrl the Wonder Gurrl Cat! Purrl arrived in my life only a couple of months ago, a homeless stray who gave birth to 4 gorgeous kittens two weeks ago…so I guess that having known homelessness, single parenting and hunger, she is well qualified to sit in the Phoenix fire and claim her brand new, purrrrfect life…. Don’t you love her little face? This entry was posted on March 13, 2007 at 10.34	and is filed under Art, Beloved Pets, Creativity, Imagination, Lifes Stories, Mandalas, The Art of Change. You can follow any responses to this entry through the RSS 2.0 feed. You can leave a response, or trackback from your own site. 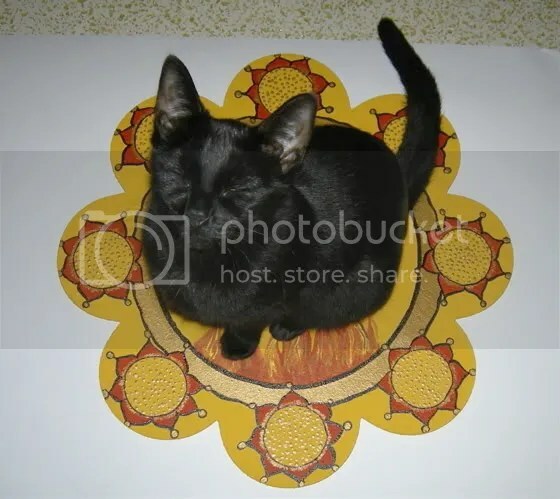 I love love love this photograph of your cat in the mandala. How wonderful!